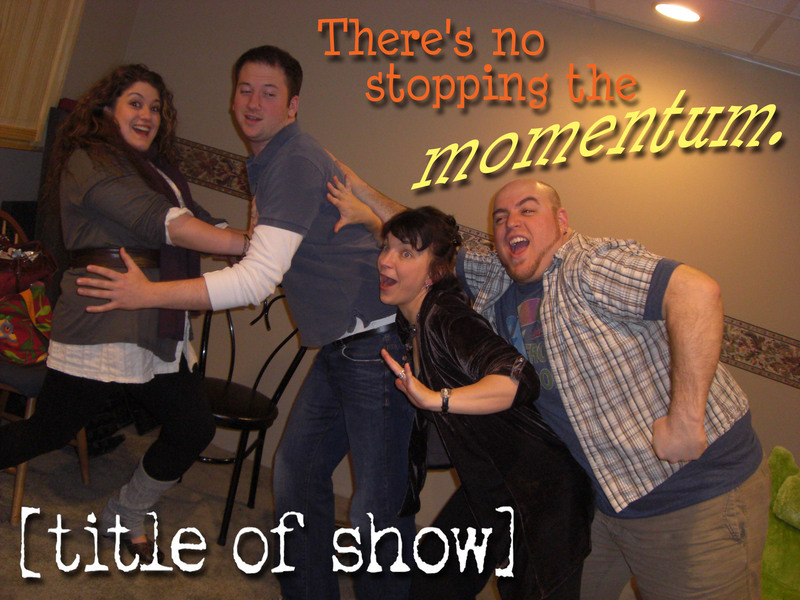 Tickets are selling fast for [title of show]. Reserve yours now! Not Your Mom’s Musical Theater is busy multi-tasking this week. We’ve got folks building signs and making costumes, creating new posters and sending press releases, and of course, rehearsing non-stop for [title of show]! Ticket sales are picking up (Saturday January 22nd at 7 PM is the most popular so far) so we suggest you choose a date and buy your tickets, as the show is next weekend and the following weekend only! Although this show is at the Derryfield School, it is NOT in the big auditorium-it’s in the Lyceum, which is a lecture hall in the Upper School building, and it only seats 70 chairs and 6 standing room only customers. So please reserve your tickets now (they’ll be held at Will Call for you at the door) to save yourself the chance of us selling out and you missing out on this show. Thank you as always for supporting our quirky, affordable musical theater model. We couldn’t do it without you! [title of show] tickets and a new vlog! [title of show] opens tomorrow!